Like most Canadians, you probably do not spend much time up on your roof. Why would you, when there is so much to do with your feet on the ground? Our Gorillas, however, have a knack for climbing – and cleaning – roofs. In order to keep your property in good, working order, regular maintenance is a necessity. 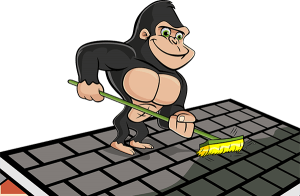 By enlisting our Gorillas for your Surrey roof cleaning and moss removal, you can rest assured that you are doing the most you can for your property. A proper roof cleaning service is easy to put off. One day leads to another and before you know it, you are dealing with a ton of clutter and moss growth. It might not seem like much but these can lead to much larger issues. Organic clutter not only slides down and fills gutters but captures and retains moisture. This moisture seeps into cracks, softening surfaces and creating leaks and holes that can reach the interior of your home. Once moss starts to grow along surfaces, it moves quickly! Moss can creep into even the most narrow spaces, including underneath singles. Once underneath, moss spreads, lifting shingles away from decking and exposing the materials below. One of the biggest mistakes that property owners make is to try to tackle roof maintenance on their own – usually with pressure washers. Simply pointing and shooting is not enough to get roofs moss free. In the wrong hands, these power tools can damage roof shingles and lead to water damage. In order to keep ahead of clutter and growth, our Gorillas highly recommend semi-annual services, usually in spring and fall. The first step to any successful job is safety. Our Gorillas operate in teams and use tie-offs to ensure that there is no risk of taking a tumble from the height of your roof. Once technicians are safely situated on your roof, then the fun can begin! If you prefer to keep both feet on the ground, don’t worry! Technicians keep you informed with ‘before and after’ photos, so you can see the difference a little TLC makes. Roof clutter and organic debris is taken care of first, providing a clean canvas for any moss and algae removal. Moss is then removed carefully so as not to disturb any of the materials that might have become softened underneath. This provides technicians with a full view of any and all damage that has been caused by this moist menace. Full reports are given to clients upon completion of the service.